Use only rock salt in everyday cooking as per your requirements. Do not drink more than one or two cups of tea in a day. Camel milk works best for those who have kidney problems.If it’s not available, boiled skimmed goat or cow milk can be consumed after adding dry ginger or ganthoda powder. Vegetables must be washed with clean water thoroughly before cooking. Vegetables like bottle gourd, cucumber, ladyfinger, ivy gourd,fenugreek leaves, onion, garlic etc can be consumed by boiling or by heating with less quantity of oil. Apples and ripe papaya can be eaten among fruits. For breakfast, khakhara, poha, bhakhari can be eaten. Do not eat any pulses other than moong or moong dal. Do not add salt to food items like bhakhari, roti, rice. Do not have pickles, papad, papadi, chutney and completely avoid sour items. Do not eat foodstuffs like ganthia, bhajia, cake, biscuit, bread,halwa, handva, dhokla which contain baking soda or baking powder. Also avoid items containing refined wheat flour(menda). Do not eat namkeen, wafers, jams, tomato sauce/ketch-ups,peanuts, chana. Do not have non-veg food like meat, fish, chicken. Have ghee, oil in low quantity. Do not have fried items at all. Do not eat any kind of dry fruits and avoid sleeping for 2 to 3 hours after lunch. Do not have any soft drinks as all of them contain high levels of phosphorous. Do not have honey, coconut water and all fruit juices as they contain high amount of potassium. Start your medicines only if you are able to follow this strict diet regimen. If you undergo treatment while observing this regimen, your kidneys will definitely function well. Take hot water bag and try to give warm massage to the part of kidney which are on outer side below our chest or immerse up to navel inside the warm bathing pool. Do it 10-15 minutes on daily basis. Keep the dinner on lighter side & do walk about 30 min at normal speed after dinner. If you find vomiting,nausea or constipation after starting the medicine than try to fast for 2-3 days. Advise to take cereals , boil vegetables, Khichdi ( rice and legumes.). If you find swelling in the limbs , than try to reduce the water intake for few days and advised to have warm milk with turmeric. If suffering for constipation than advise to treat it with Aryuvedic medicine as under with doctor’s advise. To enhance hemoglobin level in the blood , one can take Dates, Jaggery , figs , Beat root & Carrot. To enhance the immunity level in Kidney disease, one should take enough amount of Chavanprash on daily basis two times a day morning & evening. For the good function of kidney & prevent constipation , consume lighter food or try to consume turmeric, ginger , harde in enough quantity. General Fatigue & malaise Edema. UTI or Urinary Tract Infection. 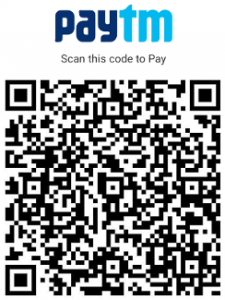 How Aayuneph Contents works ? (Boerhaavia diffusa) has shown antibacterial activity, mainly against Gram-negative bacteria. Extracts of Boerhaavia diffusa leaves showed antioxidant and hepatoprotective properties in pharmacological models. Punanavine, an alkaloid isolated from Boerhaavia diffusa has been shown in vitro anticancer,antiestrogenic, antiamoebic and immunomodulatory activity. (Alhagi camelorum) Alhagi maurorum has been used locally in folk medicine as a treatment for glandular tumors, nasal polyps, and ailments related to the bile ducts. It is used as a medicinal herb for its gastroprotective, diaphoretic, diuretic,expectorant, laxative, antidiarrhoeal and antiseptic properties, and in the treatment of rheumatism and hemorrhoids. The plant is mentioned in the “Quran as a source of sweet Manna”. It has also been used as a sweetener. (Vitex negundo) The principal constituents the leaf juice are casticin, isoorientin, chrysophenol D, luteolin,phydroxybenzoic acid and D-fructose. The main constituents of the oil are sabinene, linalool, terpinen-4-ol, β-caryophyllene, α-guaiene and globulol constituting 61.8% of the oil. In vitro and animal studies have shown that the plant has potential anti-inflammatory, antibacterial, antifungal and analgesic activities. (Woodfordia fruticosa) The flowers are, depurative, utreine sadative, antibacterial, corrective of urinary pigments, febrifuge and alexeteric. (Cichorium intybus) Remedies made from the chicory are a very effective and mild bitter tonic to alleviate problems affecting the digestive tract or the liver. In terms of therapeutic value, the chicory root remedy has a similar action to that made from the root of the dandelion herb – botanical name Taraxacum officinale. The chicory herbal remedy boosts the functioning of the stomach and the liver, while cleansing and detoxifying the urinary tract at the same time. Aayuneph Pack controls blood glucose by elevating plasma level of insulin. Long term usages of Aayuneph Pack helps insulin dependent patients to reduce their dose. 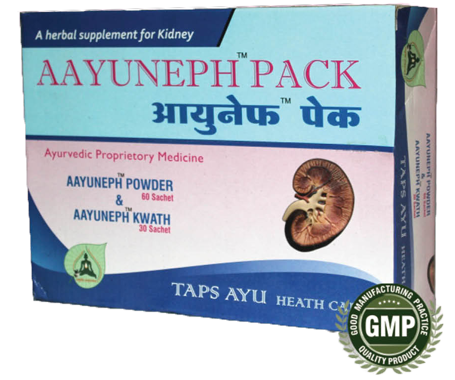 Aayuneph Pack has alkaline and basic contains which regulates PH value and acid exoretion. Protein and calorie of its herbs avoids net negative nitrogen balance. Metabolic acidosis is most common in diabetic nephropathy and obstructive uropathy. 5% of the CKD are of polycystic kidney disease. Aayuneph Pack acts on hypothalamus and pituitary gland and release vasopressin that suppress cyst growth. It targets the epidermal growth factor receptor tyrosine kinas to control cell proliferation. In women with CKD, estrogen levels are low. In that case Aayuneph Pack regulates menstrual abnormalities and help women to conceive and decreases spontaneous abortion ratio. In men with CKD this powder increases sexual dysfunction and oligospermia . By working on stimulation of renin enzymes and aldosterone it controls the retention of Sodium (Na+) and H2O. By this way it controls plasma volume and cardiac output. As creatinine is relatively insensitive index of GFR, Aayuneph Pack directly works on creatinine level by its diuretic and vasodilator action. Acts as Ace inhibitor and by vasoconstriction effect on efferent arterioles of glomerulus, It reduces both intraglomerular filtration pressure and proteinuria. 1 Sachet 4 cups of water in mud/steel pot.